Municipal bonds are popular with retirees because they provide tax-free income. Some pay secure yields above 6%, which translates to 10% tax-equivalent payouts to folks in high tax brackets. But buying individual municipal bonds isn’t easy. Many brokers don’t offer them, and the ones that do usually try to sell low quality munis that big institutions have avoided because they know the bonds are poor quality – like the dogs issued by Puerto Rico or Detroit. But most munis are perfectly secure. Ideally, you want to get your hands on the municipal bonds that institutions are buying. Many people think that’s impossible, but it isn’t—it just means we need to think laterally. There is a universe of municipal bond funds that are purchased and managed by large institutional investors. 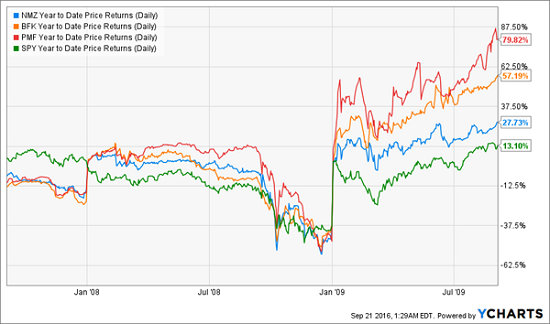 These bond funds pay high dividends—over 6% in some cases. Yet these funds are invested in low risk municipal bonds that have a historical default rate below 0.1%. In fact, municipal bond defaults are so rare they’re major headlines when they do happen. On top of their low default risk, municipal bonds also provide tax-free income to most Americans. 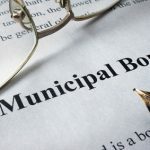 The tax situation may vary depending on your state and the fund you choose, but in many situations muni investors pay absolutely no federal income tax on the dividends they get from their municipal bond funds. Some are state exempt as well. Tax-free, low risk and high dividends—it’s the retirement income trifecta. But which funds should you buy? Let’s start with the BlackRock Municipal Income fund (BFK), which pays a 5.8% dividend yield and has a total return of 44.3% over the last three years. The fund’s largest holdings come from New York, California and Texas. Another bonus with BlackRock is they are one of the biggest bond buyers in the world, with tremendous influence in the market. These guys have the inside track on the best deals. Next is the Nuveen Municipal High Income Opportunity fund (NMZ), which pays a 6.4% dividend—one of the highest in the municipal bond fund universe. This fund’s biggest holdings are issued by Illinois, California, Nebraska and Ohio. Nuveen’s funds have grown in popularity, making them a great money manager to partner with as well. Third is the PIMCO Municipal Income fund (PMF), which pays a 6% dividend and its primary assets come from New Jersey and New York. 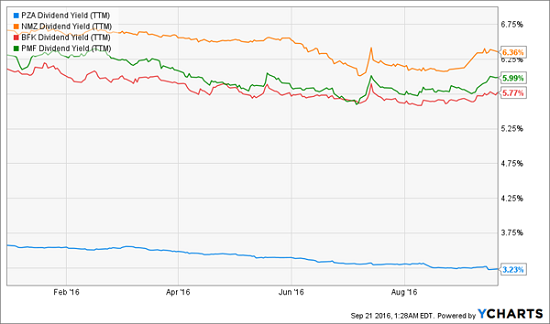 Pimco is a famous bond buyer, although they’ve been losing ground to BlackRock lately. Still, their municipal bond funds have billions in assets and Pimco is still a big player in the muni universe. Finally, we have the PowerShares Insured National Muni Bond (PZA). This fund pays just a 3.2% yield, but is also one of the lowest risk municipal bond funds out there. Because its holdings are insured, they are literallyprotected from default. While that’s very unlikely, you can sleep well at night knowing that if this fund’s bonds default, you’ll still get your money back. 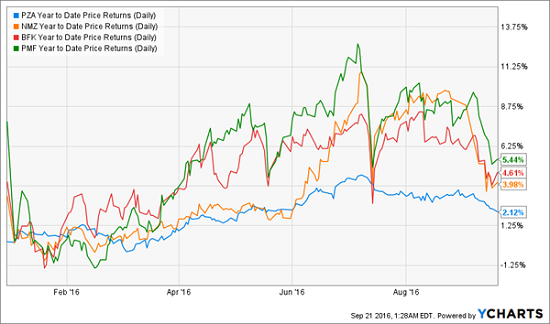 An average yield of 5.3% and a YTD price return of over 4% so far on top of a 3-year total return of 46.3% on average. Those are some extremely impressive numbers. Here’s one way to think about them. A $500,000 investment in this portfolio provides a tax-free annual payout of $26,700. That’s about the same as a $35,000 salary for a married couple living in California. Yes, it’s possible to get a middle class lifestyle from passive income on just $500,000—and municipal bonds make it possible. Also note that these funds recovered faster than the S&P 500—and outperformed them significantly by the middle of 2009 when the market was fully in recovery. The key takeaway is this: during the worst financial crisis in living memory, these funds fell for about six months—and then promptly recovered and earned a huge profit. With that nice recent bump in yields, we can jump into municipal funds and secure a meaningful great passive income stream. Even with just $500,000, we can consider retiring with these funds. Now muni bonds aren’t the only way to secure a high income portfolio for retirement on a half million or less. I have three more lesser-known plays that make up my “no withdrawal” portfolio strategy that provides a high dividend payout and no need to sell shares. This is important because portfolios that don’t require sales are more durable during market downturns. If your portfolio’s value falls in a downturn but you don’t have to sell, you can wait until the downturn corrects itself—as it inevitably will. As long as your dividends are secure, you don’t care what the market does. You can’t do this buying blue chips paying a paltry 3% – but you can achieve financial independence for retirement with yields of 6%, 7% and especially 8% or better. As I said, there are three types of funds you want to invest in to achieve this. Click here to learn how these funds work, why most investors don’t know about them, and my best buys to lock in these 8% income right now.